The Himalayan, or Himmie for short, is a Persian in Siamese drag, affectionate but discriminating. See all Himalayan characteristics below! The Himalayan, or Himmie for short, is a Persian in Siamese drag. Unlike its parent breeds the Persian and the Siamese, which are considered natural breeds, meaning they weren’t created through human intervention, the Himalayan is a man-made breed developed by crossing Persians with Siamese to bring in the color points and blue eyes of the Siamese. Breeders began to work toward this goal in 1931, at first simply to determine how the colorpoint gene was passed on. Through selective breeding over a period of years, cat breeder Virginia Cobb and Harvard Medical School researcher Clyde Keeler developed longhaired cats with the distinctive colorpoints of the Siamese. The first kitten to be called a Himalayan was named Newton’s Debutante. 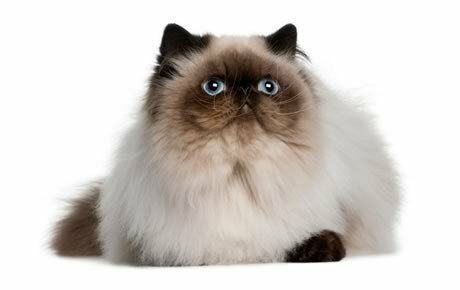 In the 1950s, British and North American breeders became interested in achieving a Siamese-pointed Persian. Starting with the Cobb-Keeler “recipe” to get the colorpoint pattern, they then bred the cats back to Persians to establish breed type. Once the cats bred true, recognition as a breed was sought. This is a medium-size cat. Himalayans usually have a weight range of 7 to 12 pounds. Like the Persian, the Himalayan is sweet, docile and quiet. She is an ornament to any home where she can enjoy sitting in a lap—surely her rightful place—being petted by those who are discerning enough to recognize her superior qualities, and playing house with kind children who will gently comb her hair, wheel her around in a baby buggy (but not dress her up), let her chase an interactive toy, then serve her tea at their parties. Himalayans are affectionate but discriminating. They reserve their attention for family members and those few guests whom they feel they can trust. Loud environments aren’t a Himalayan’s style; they are sedate cats who prefer a serene home where little changes from day to day. With large, expressive eyes and a voice that has been described as soft, pleasant and musical, Himmies let their simple needs be known: regular meals, a little playtime with a catnip mouse or feather teaser, and lots of love, which they return tenfold. This is one cat who is unlikely to climb up your curtains, jump on your kitchen counters, or perch on top of your refrigerator. She is perfectly happy to rule her domain from the floor or more accessible pieces of furniture. When you are at work or are busy around the house, the Himalayan is content to adorn a chair, sofa or bed until you are free to admire her and give her the attention she willingly receives but never demands. The most important thing to understand about caring for a Himalayan is the need for daily grooming. That long, beautiful coat doesn’t stay clean and tangle-free on its own. It must be gently but thoroughly combed every day, and regular bathing—at least once a month—is a good idea. Another factor to consider is the litter box issue. Litter may become lodged in a Himalayan’s paws or coat. If the cat and the litter box aren’t kept scrupulously clean, a Himmie is more likely than most to just stop using the box. Excessive tearing can be a problem in this breed, so wipe the corners of the eyes clean daily to prevent under-eye stains from forming. Brush the teeth to prevent periodontal disease. Daily dental hygiene is best, but weekly brushing is better than nothing. It’s a good idea to keep a Himalayan as an indoor-only cat. He’s not a scrapper and would fare poorly against other cats, dogs, coyotes and the other dangers that face cats who go outdoors. Himalayans who go outdoors also run the risk of being stolen by someone who would like to have such a beautiful cat without paying for it. In all respects but coat pattern, the Himalayan shares the Persian’s sweet expression and soft round lines. It has a large, round head; large, round eyes; a short nose; full cheeks; and small ears with rounded tips. The head is supported by a short, thick neck and a deceptively sturdy, muscular body—a type known as “cobby.” A Himalayan’s legs are short, thick and strong with large, round, firm paws. The tail is short but proportional to the length of the cat’s body. A long, thick, shiny coat with a fine texture completes the Himalayan’s look. It’s long all over the body and includes an immense ruff around the neck, a deep frill between the front legs, long ear and toe tufts, and a full “brush,” or tail. The Himalayan is bred in the following point colors: chocolate, seal, lilac, blue, red, cream tortie, blue-cream, chocolate-tortie, lilac-cream, seal lynx, blue lynx, red lynx, cream lynx, tortie lynx, blue-cream lynx, chocolate lynx, lilac lynx, chocolate-tortie lynx and lilac-cream lynx. The body is various shades of white to fawn with color only on the facial mask and the feet, ears and tail. Unlike the Persian and the Exotic, the Himalayan’s eyes come in only one color: a deep, vivid blue. Himalayans come in different “looks,” known as extreme and traditional. “Extreme” Himalayans, those seen in the show ring, have a flatter face, which may come with breathing problems. Cats with the traditional look have a more old-fashioned appearance, with a face that is not as flat and a nose that is set lower on the face with more of a “break,” permitting easier breathing. They are registered by the Traditional Cat Association. Himalayans aren’t the best choice for a houseful of boisterous children and dogs, but they have no objection to being the object of a gentle child’s attentions or to rubbing along with a friendly dog who doesn’t chase them or otherwise cause them anxiety.